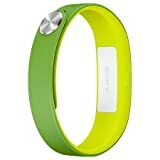 Comfort wristband for Fitbit, Misfit, and Sony SmartBandThere's more to life than steps and reps. Whether you're monitoring every step, every lap, or every night's sleep, our Sleep Sport Band is soft, breathable and comfortable 24/7 - the perfect place to tuck your sleep or fitness tracker into when you're ready to count some Zs.A perforated brushed spandex band with an inline pocket holds your tracker, making it easy to adjust your Sleep Sport Band with a velcro closure. And we've included an extension band so you can convert the wristband to an armband on the fly. Enjoy true hands-free calling with the white Sony SWR30 SmartBand Talk. 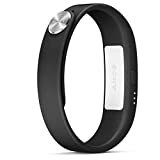 This wristband-style wearable connects to your Android smartphone via Bluetooth allowing you to compose and read texts emails and more as well as place and answer calls. Its 1.4 curved E Ink display remains clear and visible while consuming little power. The SmartBand Talk has a microphone and loudspeaker built in and vibrates for incoming calls. When paired with the free Lifelog app you can record memorable audio for your own Lifelog while on the go. It supports voice commands for handsfree convenience in six languages. Included with your SmartBand Talk are a small and a large wristband. 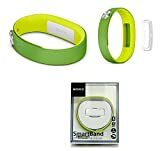 Wristbands can easily be swapped with other optional wristbands in a variety of colors. 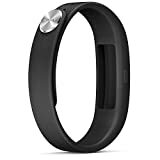 The Sony SmartBand SWR10 is an innovative Life logging wrist band that lets you keep track of everything you do. Pairing with your smartphone via low energy Bluetooth, activities are logged in Sony's Lifelog app. These activities include your physical, social and entertainment activities. You can see how active you were, where you went, what pictures you took, where and when, what the weather was like and how you have been communicating with your world during any day. All of these activities are used to allocate activity points and encourage you to be more active. Think of it a motivational tool on your wrist and in your pocket. Movement/Activity Monitor The Lifelog app can see if you have been walking, driving, cycling, travelling by train and even how you have slept. 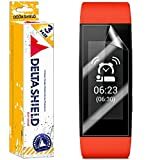 It counts steps, calculates speed, and can even monitor your sleep pattern and wake you up when you've slept enough according to your sleep cycle. It's nice to know how much you move. And where. Entertainment Log The SmartWear Lifelog app collects all your camera and music activities and presents them in a fun and animated interface along with your activity. On any day, you can see what pictures/video you took, what music you were listening to and for how long. And what you were doing at the time. Communications Log In the Lifelog app display, you can see how much you were communicating with your friends, what was said, when and how. You can look back on your life and your journey through it. Life Bookmarks At any time of any day, press the Life Bookmark key on SmartBand and everything going on at that moment is caught and remembered forever. Personalise The SmartBand is a 24/7 wearable device. It is waterproof and you can have it on you whatever you do. It is also discreet and designed to look great with any clothing style. An iconic light metal fastening button and LEDs give it a premium look and feel.